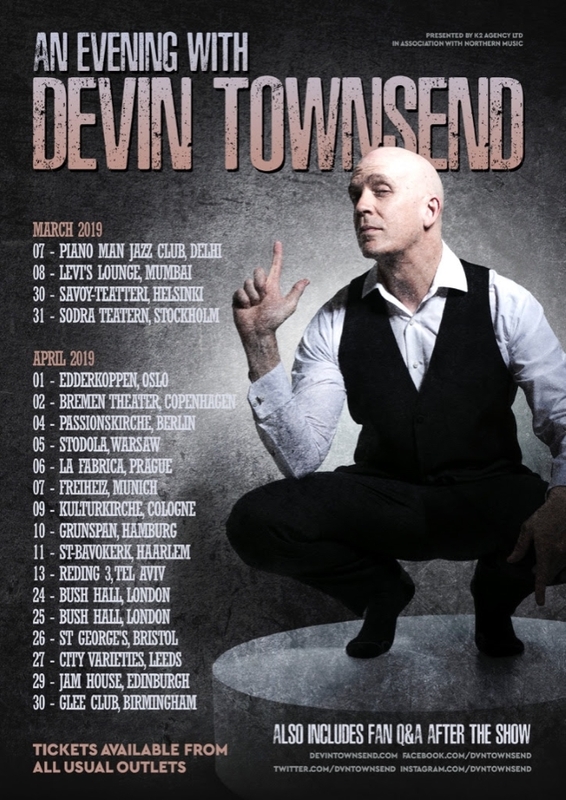 Devin Townsend has announced a very special European "An Evening With" solo acoustic tour, beginning at the end of March 2019 and running through April. The intimate evenings will feature Devin performing tracks from across his catalog, as well as taking part in a question-an-answer session where fans will get to know more about what Devin is up to at this stage in his career and the forthcoming album "Empath". This will prove to be a unique and special experience for all in attendance. He comments: "I have been busy making my newest recording, 'Empath', over the past year. It has been a complicated and enlightening experience in that I have gone back to my roots in terms of what my motivations are for making music, in hopes that I am able to move forward as a musician being as true as I possibly can to my motivations. The result is an album that I am exceptionally proud of, one that is uncompromised and diverse in ways that accurately represent where I'm at now at the age of 46. 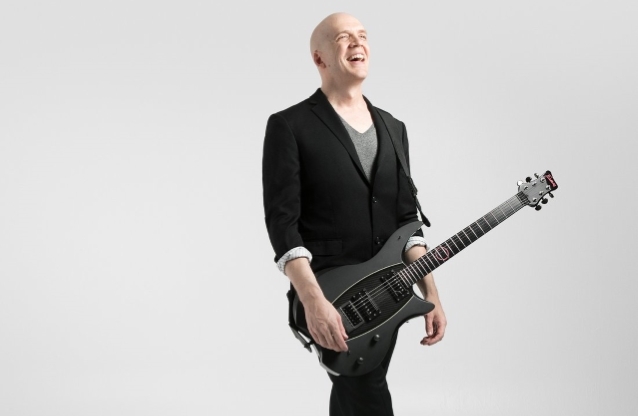 "The past decade of relentless touring with DEVIN TOWNSEND PROJECT had been something that caught up with me in a big way, and as a result, I felt I needed to step back from that world and analyse myself and make this music before stepping onto a stage again. The time has come, however, for me to take the next step in my career, and when asked about how I would like to do so, I decided the first thing I would do was a very intimate run of shows that allows me to play my music stripped back to just me and a guitar. The shows are at nice venues, and includes a spoken-word element with questions from the audience as well as aspects of my entire career represented in this one show. "Before I tour with a band again, I wanted to have the opportunity to play for you, and meet up with the people who not only have made my work possible, but inspire me to continue. In a world of computers and social media, to be stripped of all the bells and whistles is a very important step for my reintroduction to the live concert world. I truly hope you'll join me and I look forward to being the most honest I can be with you at these special shows. "Thank you to Andy Farrow and Northern Music, Thomas Waber and InsideOut records, as well as all who have supported me during this period. I have not been as proud of an album as I am of 'Empath' in many years, and I really needed to get this out of my system." Devin recently announced that he had signed a brand new contract with InsideOutMusic on the eve of their 20th anniversary of working together, for the release of new albums, including "Empath" in 2019. In what has been a rare quiet year for Devin when it comes to touring, there has still been plenty of activity. On September 22, 2017, DEVIN TOWNSEND PROJECT played a special show at the Ancient Roman Theatre in Plovdiv, Bulgaria, celebrating the 20th anniversary of the landmark "Ocean Machine" album in full, as well as a set of fan-requested tracks alongside the Orchestra of Plovdiv State Opera. This concert was filmed, and recently saw its release as "Ocean Machine - Live At The Ancient Roman Theatre Plovdiv". "Ocean Machine - Live at the Ancient Roman Theatre Plovdiv" is available as a limited deluxe 3CD/2DVD/Blu-ray artbook (with liner notes from Devin and a special documentary on the second DVD and Blu-Ray), special edition 3CD/DVD digipak, standalone Blu-ray and as digital audio download. Devin's varied back catalogue is also being celebrated with lavish vinyl box-sets under the name of "Eras". Having already released parts 1 and 2 earlier this year, December 7 will see the release of part three, which features some of his most recent work with DEVIN TOWNSEND PROJECT, including the albums "Accelerated Evolution", "Epicloud", "Sky Blue", "Transcendence" and the first-ever vinyl release of the second part of the DTP's now-legendary Royal Albert Hall show.